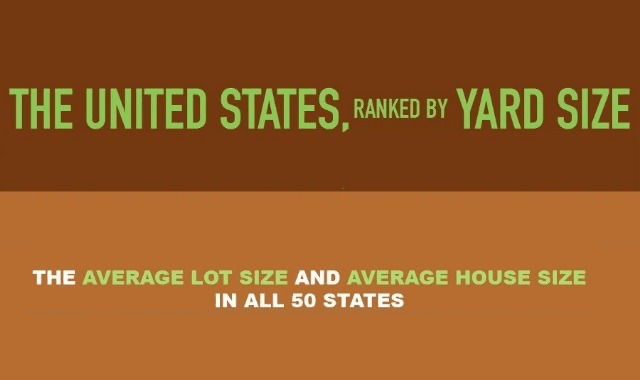 The United States, Ranked by Yard Size: Vermont Residents Have the Biggest Yards! #Infographic ~ Visualistan '+g+"
Are you looking to settle in big, open spaces? Are you hoping for a massive backyard for the kids and pets to play in? Well, depending on where you are in the US, you might get more yard with your house. HomeAdvisor.com took a look at what the average yard is like at every state by comparing yard and lot data. The results were pretty surprising. For example, everything is big in … Vermont?! Locals in Vermont get more yard by square foot than the rest of the United States, and about ten times that of the state of Texas! While the average yard in the U.S. is about 10,000 square feet, the state with the smallest average, Nevada, has less than half of that. It, California, and Arizona are all low on backyard space for the average home-buyer. Meanwhile, Vermont, Montana, Mississippi, New Hampshire, and Maine are all winning for the most space that comes with their houses. Naturally, these are state averages, so upstate New York, for instance, will be very different than downstate. Where should you look to buy a home? Or, if you already have one, see if your yard compares to the national or your state’s average on this infographic from Home Advisor!